Okay, here he is as promised, the summer dragon I stitched on Jenna‘s RR. I really like the way it turned out. The greens are so vibrant. My only wish is that the backstitch(boy was there a ton) showed up a bit better. The tendrils between the leaves are particularly hard to see on the black. Now it is off to Outi in Finland. Next up in this RR is the fall dragon. 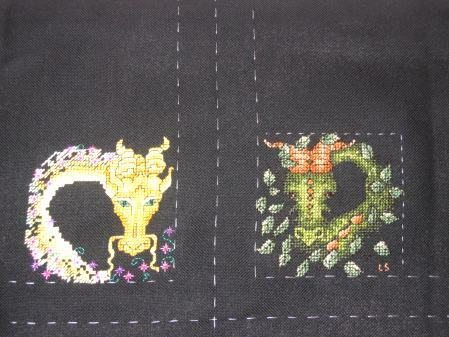 Here is a picture the two that have been stitched so far. I have also finished about half of the stitching on the birthday exchange I am working on. I hope to have it done tonight or early tomorrow so I can get it out tomorrow. I am pleased with the amount of stitching I have been done lately. I have even picked out a pattern for the current round of my neighborhood RR. Yeah me! He looks wonderful! Lovely work! OMG, Leslie. He looks fabulous! Thanks so much for doing such a great job. Don’t worry about the tendrils not showing up. I’ll figure something out when it comes home. 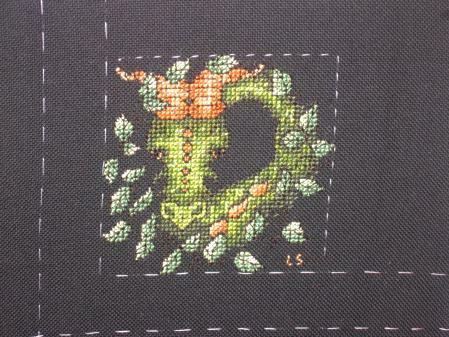 Maybe I’ll find a green Kreinik BF that goes with the leaves and backstitch over the tendrils with it. Thanks for your hard work! I’m working the backstitch on Christine’s this weekend and I know what you mean. There really is a ton of it! Oh Leslie! Jenna is going to love it!! Her fabric is gorgeous!! Wow! I love it on the black, and I can definitely see all that tiny backstitching! Whew! Congrats on finishing it.